On a cold, bright February day around 40 people gathered at Three Wheels for the 125h London Eza which began with a service to the Buddha; incorporating memorial observances for Mr John Fison – a descendant of Professor William Williamson – who had recently passed away. 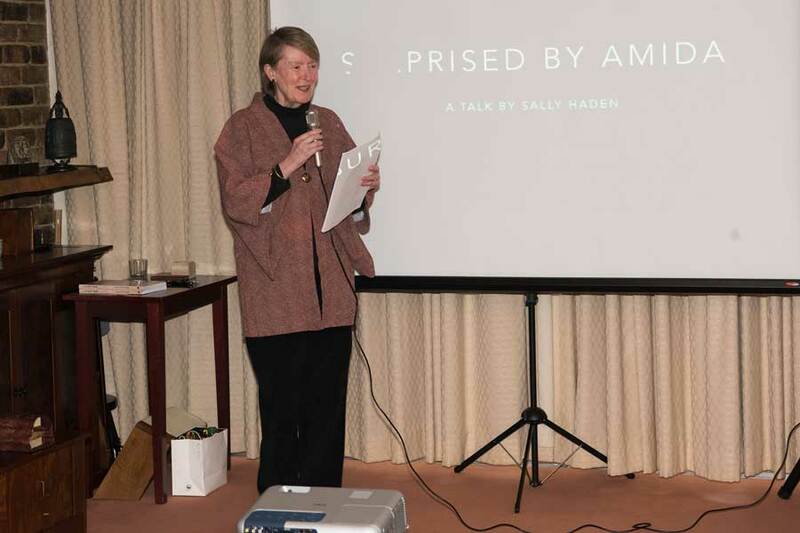 Following the service, Mrs Sally Haden gave a talk entitled ‘Surprised by Amida’. First of all Mrs Haden used a clip from a film about the Choshu Five to illustrate her fundamental discovery that ‘encounter requires courage, and surprise is part of the path’. She then talked about her three ‘surprises’ which were respectively discovering her family history, Japan, and Amida. She said that her family history ‘found her’ in the form of a rusty box full of old family photographs which had been discovered buried under a factory floor. While researching these photos she learnt of her great-grandfather, Mr James Speed, who had travelled to Japan in the early Meiji Era (from 1879 to 1883) in order to help pioneer modern Western-style glassmaking. And though researching this family history together with her family, Sally and her brother were drawn closer together than before. Ms Sally Haden giving her talk. In the course of her researches Mrs Haden fortuitously encountered a Japanese glass enthusiast who invited her to go to Japan and give a talk to a group of glass collectors. With a grant from the Sasakawa Foundation, and advice from Rev. Sato, she was able to make this trip; visiting the site of the glassworks in Shinagawa, Tokyo where her ancestor had worked, and meeting glassmakers in a direct instruction lineage with the Englishmen – like her great-grandfather – who first taught modern glassmaking in Japan. While travelling home after this climatic journey Mrs Haden began to feel strangely unsettled. What would she do now? But when she arrived back in England she found her brother had completed the book that they had worked on together and she realised again how wonderful it was that the work had drawn them together. In addition, looking back on her journey she realised that her experiences were a continuation of something great that her great-grandfather helped to begin. In this spirit she continues to embrace the new encounters that she received in Japan and is now involved in many related projects, including helping a young Japanese glassmaker to market his glass in London. Rev. Sato thanked Mrs Haden for her talk and congratulated her on the great work of inter-cultural dialogue and discovery she has been developing for over a decade on a sound foundation of spiritual introspection. He expressed his gratitude for all that British people past and present have done for the Japanese people.